I’m his mum, it’s my job to embarrass my kids. Actually his friends all know what he is like so it’s not like I’m giving away a major secret. Then my lunch (half) hour was over, so I had to wait till tonight to finish. So for those of you who don’t already know, my eldest boy ‘H’ is a tad forgetful. I’m not talking bits here or there, a letter from school, a sock out his PE Kit. 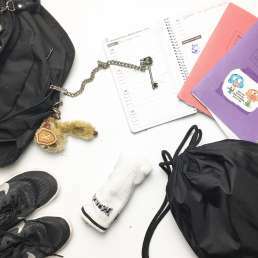 No I’m talking full bags of PE Kit, Jackets, Mobile Phones and probably his best yet a whole School Bag! School Bag x 1 incl. pencil case, school books, text books etc. I sometimes wonder if we apply too much pressure these days. So much to remember at such a young age. 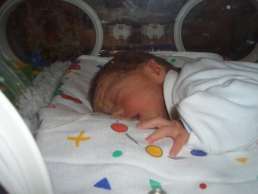 But I also have to admit that H is my boy, my baby, my preemie miracle, and I have treated him with kid gloves. So am I to blame? He’s the first born and as I say was 5 weeks premature. I know fine well that I have done more for him than my other two. The youngest, poor Samuel is left at the wayside with things in comparison with what I did for Henry. But Samuel is one of the most independent little beings that you could ever know. He certainly won’t be forgetting s**t at school (unless he deliberately choose too, which wouldn’t surprise me!). And my middle boy Fred is just so cocksure that even if he did lose or forget something, he’d not hesitate to ensure he got it back. Or at worst he’d manage to charm his way right out of it! I can also console myself with this new paper by the journal Neuron which states that not only is forgetfulness normal but it actually makes us smarter! So maybe H is a genius in the making. Those of you who know me, know just how impatient I am. 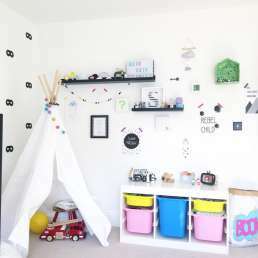 It’s a couple of weeks till payday, and to finish Henry’s room a shopping trip is required. So I’m getting styling withdrawal symptoms, and Samuels Gallery Wall Update is just what was needed. So this is how his wall looked originally, but the whole point was so I could change and update easily for him. But it had sat like this for months and months. 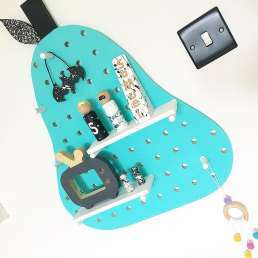 I had bought this gorgeous peg board from @DaisyMoo several months back for my own studio. But actually I realised I didn’t really have anywhere for it, so it had sat unused. I knew it would be perfect on Samuel’s wall, but lets see if he can look after it properly. You might remember a while back I mentioned in one of my blogs about using clipboards to display art. Well what better to introduce onto Samuel’s wall. It also means we can easily change up his prints whenever we want! These clipboards were only £2 each from Sainsbury’s Home. NB: I’ve listed all the wonderful small shops that are a part of this wall, along with a few high street favourites. So I have to say my first poll on Instagram was an absolute failure! LOL You guys all voting for us to bake all 5 cakes and then either invite you round or post to you wasn’t entirely helpful! Ha Ha so in the end I gave Henry the vote and he choose Chocolate Cornflake Cakes. 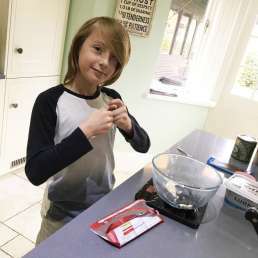 A really simple and easy recipe, it’s perfect for an older child like Henry to essentially do on his own with little supervision. Likewise it is also fun to get the little ones involved in whilst you bake. Add the butter, chocolate and syrup to a microwaveable bowl. 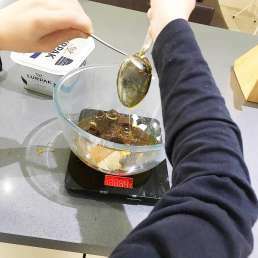 Measure out the cornflakes into another bowl. 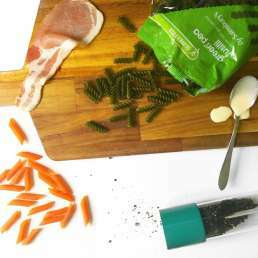 Put the wet ingredients in microwave for 10/20 secs at time, removing and stirring in between. 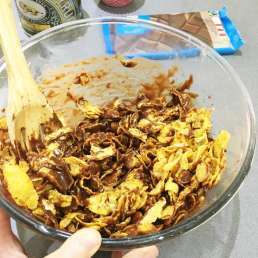 Once fully melted then pour on top of your cornflakes and mix through with a wooden spoon. 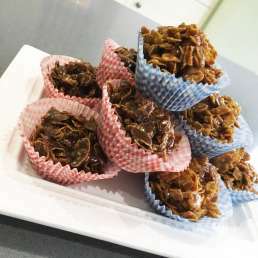 Now we made milk chocolate and dark chocolate batches and added choc to cornflakes, and cornflakes to choc. The consensus from Henry is that adding choc to cornflakes is better/easier. 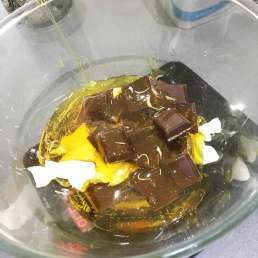 Put the mixture into individual cases and chill in the fridge for at least 30 mins. If you fancy you can add marshmallows, choc and/or glitter etc. for a little extra sparkle! We found that as we used larger cases we got six from each batch. Thanks to the original recipe from BBC Good Food. 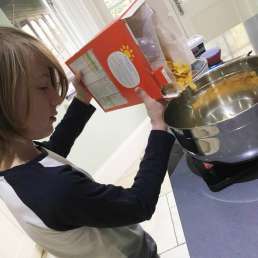 So as you may or may not know my eldest (Henry 11, 12 next Friday) has developed a real passion for cooking. Whether it’s helping with the Sunday roast, or cutting the veg for the weeknight salad, he’ll do what he can. 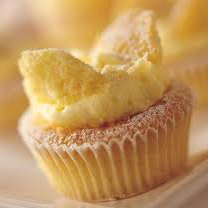 However sweet treats are always a particular favourite. 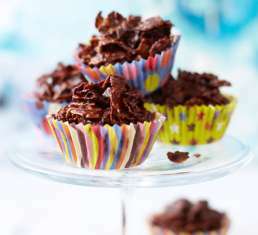 So here are our top 5 favourite kids cake recipes, perfect for cooking with your kids! I remember cooking these as a child with my mum and sisters, and I still love making them now. So easy, so simple and so tasty! 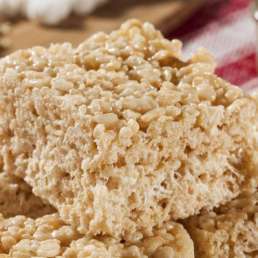 Such an easy recipe and one the kids always love to help with. Make as simple as you like or cover/add treats of your choice. Perfect for an after school or play-date treat. 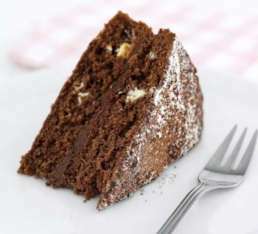 This is Henry’s favourite cake of all time along with brownies. 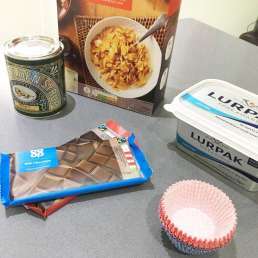 Another easy to make cake, with only 4 steps. Keeps well in the fridge! So there we have it! Now Hen and I just need to decide which one we are going to bake this weekend?! Will run a poll on Instagram if you fancy letting me know your favourite or comment below! 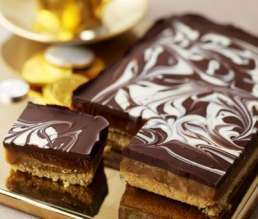 What was your favourite bake as a kid? 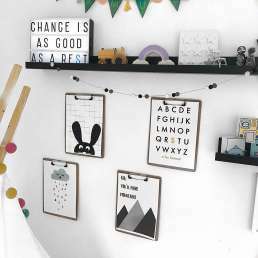 Looking for a beautiful but simple way to personalise your child’s room? Or maybe you’d like to make a gift for someone’s birthday? 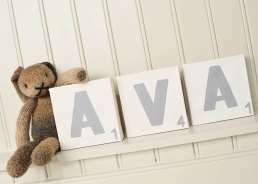 These personalised letter canvas are so simple to make and cost only £5! 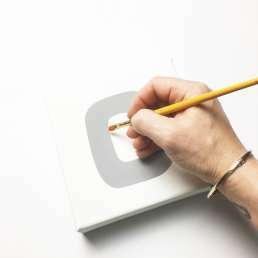 Create a letter stencil. There are two options for this, you can either print off the letter you require from the internet (making sure it’s approx 10cm high) or you can buy a papermache letter from places such as Hobbycraft or The Range for approx. £1 and use to draw round. 2. 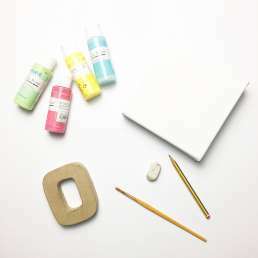 Place the stencil centrally on your canvas and draw round. Draw as lightly as possible, although any pencil marks can be erased afterwards. 3. With a steady hand paint the letter the colour of your choice (metallics are a particular favourite of mine at the moment!) with the acrylic paint. Allow first coat to dry and then paint a second time. 4. Once fully dry rub out any visible pencil lines. 5. You can also add a small number after the letter as per scrabble tiles, again check the internet to get the correct number or you can choose a specific number if the canvas is for a birthday present?! And there you have it. 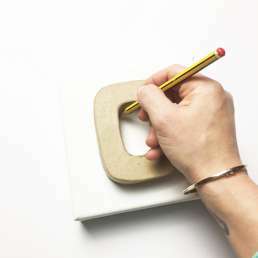 Your very own personalised letter canvas. So go on, have fun. All for only £5! So if you follow me on Instagram then you’ll know that for the last couple of months I’ve been through a bit of a change. I was made redundant from my day job of almost 9 years and it really threw me for six. It’s so hard not to take it personally and let it affect you, especially as a 42 year old mum of 3. I had everything sorted, gorgeous family, a day job I really enjoyed, my own business that was doing well. Then bam I get hit with that and it just completely upset the apple cart. I have always been one to take things personally and no matter how hard I try I can’t help but feel a little down with it all. My mojo went completely and I found it really hard to work on anything, including Henry, Fred & Felicity. However as time went on I began to realise that I needed to figure out what I should do going forward. I guess the obvious was that a couple of months of really concentrating on Henry, Fred & Felicity would possibly mean I could actually make the leap and go full time. However the more I began looking at everything, talking to the boys and actually looking at the bigger picture; the more I felt I had to just take some time out. Actually taking that step back made me realise a lot. I realised I was missing time with my boys, as every spare moment was being spent working. I had got to a stage where the level of orders I was getting meant that I was spending all my spare time making, and very little time connecting with my customers. 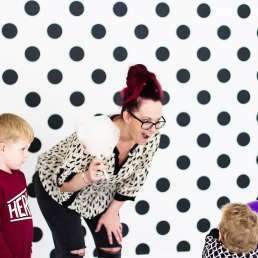 I began to realise that actually it was the talking to like minded people about all things kids and kids decor was what I actually really missed. I missed finding new small businesses on Instagram that I wanted to share with people. 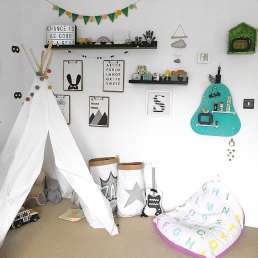 I missed having the time to decorate my own kids rooms like I promised them I would. I also realised that whilst I love making and creating, what I love even more is showing others how to do exactly the same. So there we have it, the realisation became apparent. It’s time to change things up a little. So over the next few weeks I will be gradually cutting back my product offering. I’ll also be stepping up my interaction and sharing with you guys. Sharing lots of my favourite small businesses as well as bringing you the best of the high street. What about some ‘how to’s’ so you guys can have a go at making some of the products I make? 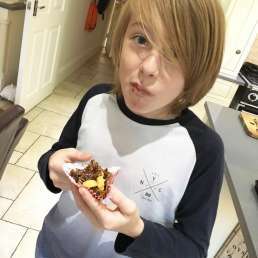 And with my eldest getting a little obsessed with cooking at the moment, then we’ll be bringing some of our favourite family recipes and bakes too. I’ve also found myself an amazing new job #wonderingwhyididntdoitsooner #timingiseverything. Still part time, but also term time only so I get to spend that extra time with the boys I’ve always wanted to. This half term was the first time I have ever had the whole holiday off with the kids since they started school I realised. And do you know what I really enjoyed it , I think they might have too! Thank you guys for always being here and being so supportive. I hope you’ll like my new set up and what I’ll be sharing. If there is anything you’d like to see then just let me know. Happy to check out for you guys! If your kids are anything like mine then pasta is always a winner, especially at this time of year. My boys love nothing more than a big bowl of pasta. They also love mac n cheese; but this simple creamy bacon pasta sauce is really tasty for a little change. Being wheat intolerant I often miss out on these meals as I’ve never been that impressed by gluten free pasta’s. However I noticed there was a couple of new alternatives on the supermarket shelf this week. Green Pea Pasta and Red Lentil Pasta, so it was the perfect time to give them a go. Cut the Bacon into thin strips, then dry-fry in a large frying pan over medium heat until crisp. Add the cream, garlic and Parmesan and cook over low heat for 4 minutes. Drain your pasta and add to the pan with the sauce. Stir well and serve with garlic bread. Top Tip: When draining, keep a little of the starchy pasta water in the pan. Add to the sauce with the pasta, it helps to thicken the sauce. What’s your kids favourite pasta sauce? We’ve never really been a board game family. I admit a slight obsession with collecting Monopoly’s means I’ve spent a lot of years hiding said board games and telling the boys they cannot touch, this may not have helped?! However several road trip holidays later (who can forget the one we left behind) and we have developed an addiction for all things cards, with UNO as current favourite! However with 3 boys ranging from 5 up to 11, it’s hard to find kids card games that are suitable for ALL the family. 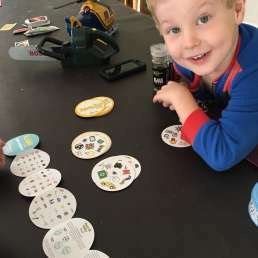 So when PikyKwiky got in touch to say they were launching a new card based game for all the family, and would we like to try; we jumped at the chance. LinkIt is educational as well as fun; which is great. Anything that means my boys are learning without actually realising is a complete bonus for me! And the great thing about card games are that you literally can take them with you, wherever you go! There are 3 different levels to play at. However the basic idea is to use the yellow deck as the ‘main’ set, whilst the blue deck is dealt between the players. The object of the game is to spot the link between the cards played. Interestingly enough the boys were much quicker to pick it up than us adults! It was great to see them trying to figure out the link and seeing who was quickest to spot it. A simple concept that is quick and easy to pick up, but really quite addictive! This has definitely become one of our new favourites as it’s great to have a game that all the family can play together. 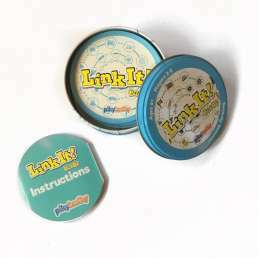 Available in original LinkIt and also LinkIt ‘Part of’ from Amazon now. Perfect for a Christmas Stocking Filler, reduced from £16.95 to only £11.95 for Part Of and £12.95 for Original!